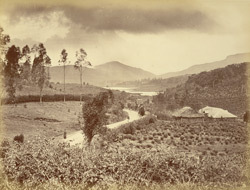 Photograph of a view at Nuwara Eliya, in Sri Lanka, with a tea plantation in the foreground taken by an unknown photographer in the 1880s, from an album of 62 views of India and Ceylon. This hill-station, whose name means 'above the clouds', was popular with the British who sought to recreate a 'little England' here. It is surrounded by tea plantations which became the most important crop on the island after the failure of coffee due to an epidemic of leaf-blight in the 1880s.